Shiraz Maher speaks with Marc Lynch about his new book, Salafi-Jihadism: The History of an Idea. 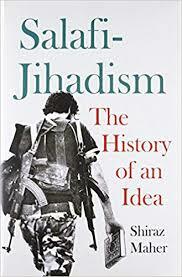 In the book, he explores the intellectual trajectory of Salafi-Jihadism from its origins in the mountains of the Hindu Kush to the jihadist insurgencies of the 1990s and the 9/11 wars. Dr. Shiraz Maher is Director of the International Centre for the Study of Radicalisation (ICSR) and a member of the War Studies Department at King’s College London. Maher is a recognized expert on jihadist movements. The BBC has described him as “one of the world’s leading experts on radicalization,” and the Washington Post has called him “a respected specialist on Islamic State.” His book, Salafi-Jihadism: The History of an Idea (Oxford University Press; and Hurst & Co.) has been widely acknowledged as a ground-breaking exploration of the political philosophy behind contemporary jihadist movements. Maher is also an adjunct lecturer at Johns Hopkins University (where he currently teaches separate courses on radicalization and political Islam), and was a visiting lecturer at Washington College during the Spring Semester of 2012 (where he taught Middle East politics).